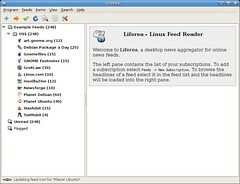 I found this link to a list of RSS readers for Linux via Robert Scobles link blog. I'm sure their are a lot more. I like both of them. I use google reader though, just because I keep switching machines/Operating systems all the time!